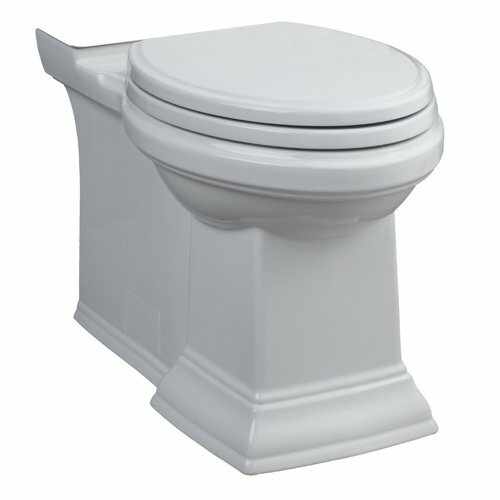 The American Standard Town Square RH Elongated Bowl with Concealed Trapway in White Review! Do you want a toilet that will give your bathroom a stately appearance? Do you want a toilet that can reduce the amount of time that is required to clean and maintain it every week? The American Standard Town Square Concealed Trapway RH Elongated Toilet with Seat offers households the chance to have an outstanding toilet for a surprisingly affordable price. Designed with a powerwash rim and an elongated siphon for better water movement, stains don’t have a chance of existing when you flush this toilet! Best of all, you’ll be able to save over 40% off of the MSRP of this toilet just by shopping on Amazon! What Are the Features of the American Standard Town Square RH Elongated Bowl? The primary feature that we really loved about this toilet is that it has a Duroplast seat that offers a slow lowering hinge. This allows it and the cover to be able to carefully close without that typical slamming action, yet won’t cause you to stand there and feel like you’re forcing the toilet seat down into the seated position. When you’ve really got to go, do you really want to be forced into waiting several more seconds just to get the seat into position? Of course not! the Town Square is backed by a 10 year limited warranty so you’re protected against defects in the craftsmanship of the toilet or the materials used to make it. If you live in an environment that requires water conservation or you just want a toilet that is eco-friendly, the Town Square is a viable toilet to use. It’s high seat, one-piece design might be a little uncomfortable for those who are more petite, but overall it will provide you with a strong, elegant experience every time. Is There an Advantage To Using the American Standard Town Square RH Elongated Bowl? The American Standard Town Square has a definite advantage with its EverClean surface. This toilet can last for years and still appear brand new thanks to this unique surface. Unlike other toilets, it’s also included on the outside of the toilet so that stains, mold, or mildew won’t build up on the outside with those misses that sometimes occur! It’s also incredibly easy to install this particular toilet, something that can be done in just an afternoon. There’s really nothing bad that can be said about this toilet. Every one comes off the factory floor 100% tested to make sure it works. In case something gets missed, you’ve got one of the best warranties in the industry backing up the product. It works well, looks better, and provides you with an amazing way to conserve water that is designed so well that most users won’t notice the difference in white! If you’re looking for a quality toilet at a fair, competitive price, then we highly recommend the American Standard Town Square Right Height Elongated Bowl. Click here to compare prices on Amazon and get the best price on the American Standard 3071.000.020 Town Square RH Elongated Bowl with Concealed Trapway in White. Need More Ideas? Looking for The Best Flushing Toilets?